On Sunday night, while recovering from a hectic weekend, I settled in and watched an episode of Planet Earth II. The addictive BBC nature documentary series explores our planet’s various ecosystems, plant life and animals. During the episode, narrator David Attenborough pointed out that humans have a greater environmental impact on the planet today than ever before. Later that night, while scrolling through my news feed, I discovered a report on sustainable bitcoin mining. It felt like fate. Just as I was beginning to dwell on environmental damage, I got a reminder that things can get better. The report – produced by CoinShares, a digital asset firm – points out that the negative press surrounding bitcoin’s energy consumption is overblown. 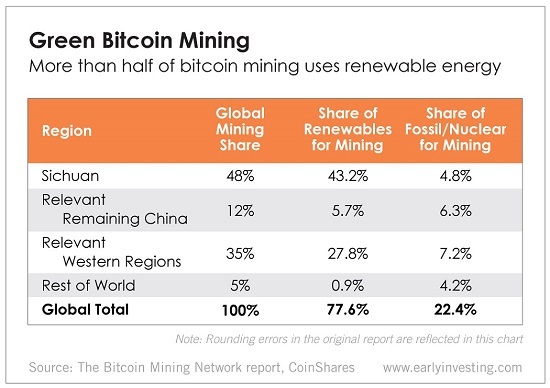 Today’s chart, taken from the report, shows that 77.6% of bitcoin mining (a conservative estimate) uses renewable energy, while only 22.4% uses fossil fuels or nuclear energy. In Sichuan, China, home to 80% of Chinese bitcoin mining and 48% of global bitcoin mining, 90% of the total energy mix was renewable in 2017. In the Pacific Northwest, Québec, upstate New York, Norway, Sweden, Iceland and Georgia, where large-scale bitcoin mines are located, the energy sectors are almost all dominated by renewables. According to the report, miners have intentionally chosen to set up shop in regions with cheap renewable energy as a way to find the most cost-efficient form of electricity. Cheap energy isn’t just environmentally friendly. It’s profitable. If demand for bitcoin mining keeps increasing, its demand alone could facilitate opportunities for tapping highly productive renewables locations in areas that today would be uneconomically remote. As governments around the world explore various forms of renewable energy, the crypto space is already ahead of the game. Just one more reason to keep your head up and keep holding.